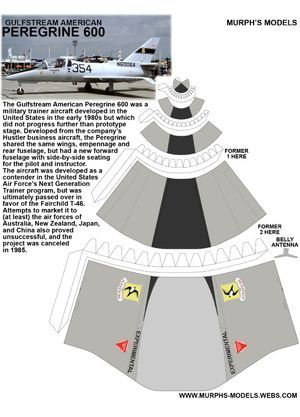 The Gulfstream American Peregrine 600 was a military trainer aircraft developed in the United States in the early 1980s but which did not progress further than prototype stage. Developed from the company's Hustler business aircraft, the Peregrine shared the same wings, empennage and rear fuselage, but had a new forward fuselage with side-by-side seating for the pilot and instructor. 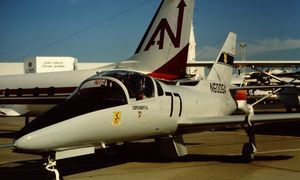 The aircraft was developed as a contender in the United States Air Force's Next Generation Trainer program, but was ultimately passed over in favor of the Fairchild T-46. 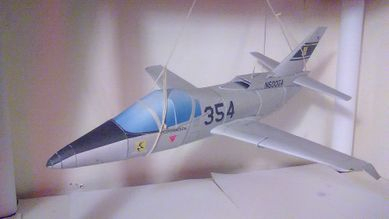 Attempts to market it to (at least) the air forces of Australia, New Zealand, Japan, and China also proved unsuccessful, and the project was canceled in 1985. The wing and rear fuselage design was incorporated in the Gulfstream Aerospace Peregrine business aircraft.